At school we have been using a program called "Paint" to draw pictures of ourselves and have used the text box to type our names. Lots of the children found controlling the mouse really difficult but their final pictures look really good. 2/4/2019 In our Forest School session this week we have been thinking some more about the children in Uganda who walk to school with bare feet. This week we have tried walking on different surfaces to see how it feels. The children walked on some sand, something hard, something that tickles, something a little bit spiky and something squishy and slippy. They finished by walking through paint and making a footprint in the colours of the flag of Uganda. Over the next 2 weeks we are going to be learning a little about Uganda. The children have already had a visit from a couple who volunteer at a school in Uganda. Our school is going to be collecting shoes to send to children in Uganda as many of them do not have shoes and have to walk miles to school barefoot. This afternoon we went out on to the yard and field to experience what it is like to walk barefoot. Today we had a visit from Pandemonium Theatre who told us 3 tales from Wales. We heard tales about Adam and The Snakes, The Dancing Innkeeper and The Person In Green. We loved listening to the tales, singing along with the songs and some children n got to take part. It was great fun. Our topic for this half term is The Weather. This week we are thinking about the wind. Here you can see fantastic windmills in the construction area. Because we are on half term break on the actual day of St.David's day (March 1st) we are celebrating it today. We have been listening to the story of Dewi Sant (St. David) and colouring a map of Wales as well as colouring the Welsh flag. 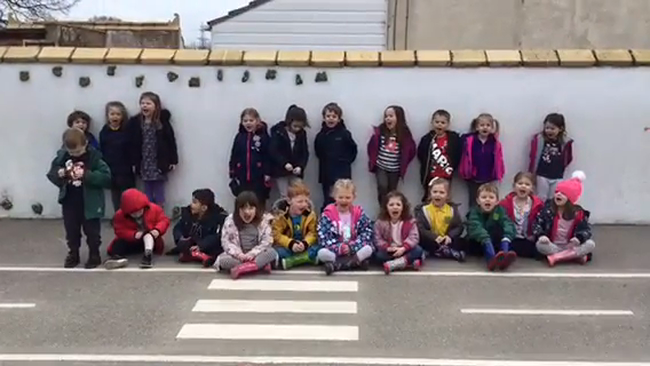 The children all came dressed in the colours of the Wesh flag or in traditional clothes or in rugby kits and we even had one Welsh dragon.They all looked gwych, bendigedig, smart iawn. This week we have been reading "Harry and The Robots." If you don't know the story ask your child because all the children have been practising retelling it and they are really good. We used recycled items to make robots. They look fantastic. We have also made some paper flowers and cards for Valentine's Day. Here is the special display in the school atrium, showing the work done by Reception as part of the whole school topic, "A Midsummer Night's Dream." You can see the potion recipes, dream catchers, the summer sorting activity as well as pictures of symmetrical fairies. Another very busy week. This week (week beginning 4.2.19) is a special week at school. The whole school is studying William Shakespeare's "A Midsummer Night's Dream." In Reception we have found out a little about William Shakespeare and are writing recipes for potions. We are writing group optic poems and wedding invitations and all the children are making their own dream catcher. In our role play area we have a church and have suits and dresses for the children to wear to pretend they are getting married. They are really enjoying dressing up. Today (1/2/19) it was our class assembly in the hall. The theme of the assembly was "helping." We listened to "Help" by The Beatles. The children had talked about who they help and had drawn a picture. They said their line and held up their picture in the assembly. We had also written a class prayer which one of the children read out too. We had a powerpoint about how Jesus chose 12 helpers. Mr. Williams was really proud of all the children and the children from other classes really enjoyed our assembly and listened really well. Our classroom and corridor look fantastic, thanks to all the children's hard work. They have been drawing toys and have created some lovely winter pictures. This week the children brought in soft toys from home. They have been talking about them and writing a description in their language books. Today (15.1.19) we had our first Forest school session of the new year. Before going out we heard the story of "We're Going On A Bear Hunt" and when we went outside on the field one of the activities was to find bears with letters on. The children had to try and make words with the letters they found. The other activity was to find things around the field and use the I pad to take a photo. Happy New Year. I hope you all had a very happy Christmas. The children have all settled back well into school. This week we have been talking and writing about the things we got for Christmas. We have been talking about the new year and all the children have thought of a new year's resolution and written a class prayer. In the shop in Numberland we have been using money to buy items and in the role play area in Letterland we have been pretending to spring clean. We have also been practising our literacy and numeracy targets. it's been a very busy start to the year. Merry Christmas to all parents, grandparents and carers of children in Class 1. Best wishes for the New Year, from Mr. Williams, Mrs. Jones and Mrs. Fewtrell. 12/12/18 Today we had our concert at the Church of The Holy Spirit. It was fantastic, Mr. Williams was so proud. The children said their lines really loudly and clearly and the singing was lovely. Thank you to everyone who helped make the costumes. Today (4/12/18) we had a visit from Coverdale Puppets. They did a puppet show about the story of The First Christmas. The puppets were great. Some of them were really funny and we got to sing along to some of the songs. Afterwards one of the puppeteers told us about different kinds of puppets and how they work. As part of our topic on colour we are carrying out a science investigation to see what happens if you put a white flower in coloured water. We got two white carnations and we have put one in clear water and one in blue water. We used the same size flower and the same amount of water in each container. We put them in Mrs. Molyneux's office to keep safe and we are going to look at them after the weekend to see what has happened. 22/11/18 Today we had some more special visitors at school. key Strings. These two musicians came to talk to us about different musical instruments. They brought lots of instruments with them and some children had a go at playing some of them. The musicians also talked about The 1st World War and marching music. Some children even put on some soldiers' hats and marched to the drums. Today we had a very special visitor. Sister Ann. Sister Ann is a nurse and she also happens to be Miss. Roberts' mum. She brought in lots of things to talk about and she dressed lots of people. She talked about injections, germs, how to keep your heart healthy, bandages and operations. We learned a lot and Sister Ann let us keep some things in our hospital role play area. Diolch yn fawr. We have had a very special week at school. As well as having important visitors (Estyn) we have been learning about Remembrance Day. We have made poppies from lollipop sticks and tissue paper, used finger paints to make a large picture of poppies and in our role play area we have a hospital to help injured soldiers. It was Forest School week too and we looked at pictures of animals we might see in the forest area at school and animals we wouldn't find in there. We also collected some leaves to make repeating patterns. The children have been wonderful and they definitely deserve a special treat over the weekend. Thankyou children. Diolch Plant. Today was our assembly. We talked about Harvest. All the children had drawn a picture of their favourite fruit or vegetable . We went ito the hall to perform in front of the rest of the infant children. They held the picture up in assembly and said "dw i'n hoffi...". They all used loud, clear voices and Mr. Williams was really proud. At the end we sang "Cauliflowers fluffy and cabbages green." Today we had a special assembly, it was our Harvest Festival. Lots of children brought in tins, jars and packets of food to share with local people who do not have much food. We had a special visitor, Mr. Slatter. He used to be a teacher at our school and now works and preaches in a church in Mold. He talked to us about Harvest and told us a story from The Bible. We sang our Harvest song, "Cauliflowers fluffy and Cabbages Green..." Class 1 children love this song. If you want to sing it at home, search on line. 3/10/18 Today we had a great time raising money for school funds. While the junior children were walking up Moel Famau we did 3 laps of the obstacle course on the school field. It was good fun but it was really tiring. Thankyou to those parents who sent in £1 donation. This week we have had a new interactive board. We can search the internet on it, watch films on it, play games on it and draw on it. It is really big. We have been drawing happy, sad and angry faces and learning the Welsh words hapus, trist and flin. This week as part of out topic we are learning about the parts of our bodies. We have been talking about the outside and inside and we have learned about the heart and lungs and veins and blood. We drew around one child and then the children helped to draw the different organs. Today was our first Forest School session. We went for a walk around the school grounds. We talked about the different areas and what we can do in each area. We went to the boundary gates and we looked at how the barrier at the main entrance works. We looked to see if the chickens had laid any eggs but they hadn't and we had a story outside. Forest school sessions for Reception children take place every other Tuesday. All the children came to school in the correct clothes and remembered a coat and wellies. Da iawn children and diolch parents. Your child has spent a few days in their new class and they are now beginning to understand the new routines. I am sure they have told you all about it. We will be doing p.e on Wednesdays and Fridays. Your child will bring his/her book bag home every night. Please return them to school every morning. Diolch.